To help monitor your online services and catch issues & anomalies before they reach your customers and become costly incidents! Detect outages, unexpected behavior & performance regressions. Minimize risk of losing customers, time, money & brand reputation. Measuring response times and uptime, checking for valid HTTP(S) response, ensuring page integrity with SHA-256 hash. Never forget to renew your web server certificate with our TLS / SSL monitoring. We will send periodic ping requests to your servers to check if they are alive. Check connectivity for arbitrary port using TCP or UDP protocols. Check DNS server entries to see if your addresses are correctly resolved. Monitor Whois details. Test your email servers with IMAP, POP3 or SMTP protocols. Why limit you with simple alerting rules? Our customizable expressions give you endless possibilities. We offer you default rules which are suitable for most use cases but we also allow you to customize them for your specific scenario. Quickly see if your services were unresponsive or had any downtime. Control the quality of your hosting services. 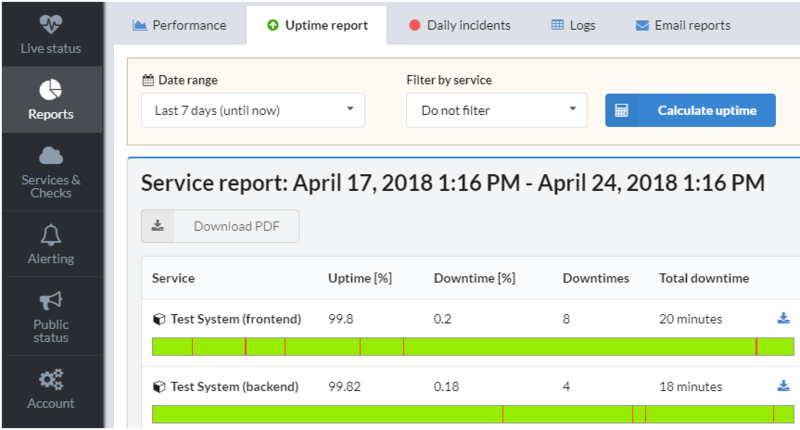 You can use our uptime report to claim your SLA refund. Visualize response performance by date range or region so you can identify potential bottlenecks. Receive daily, weekly or monthly uptime reports directly to your inbox. 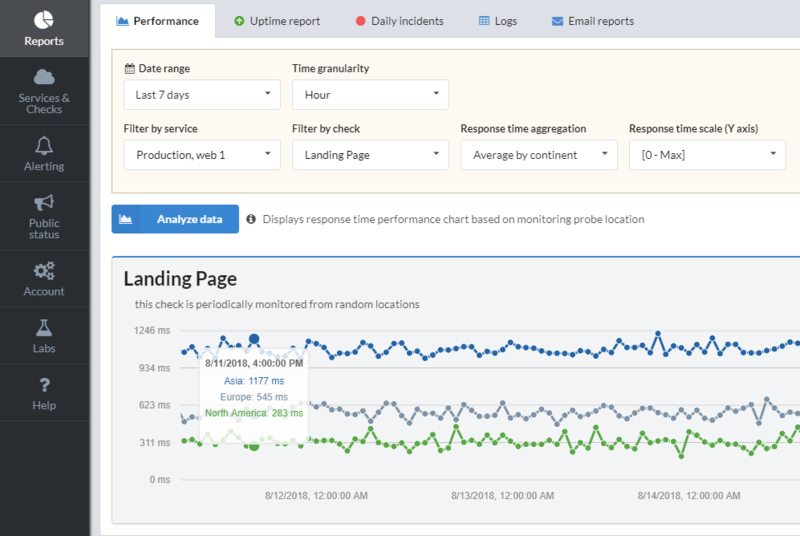 Customizable alerts give you full control over when and how your team is informed of degraded uptime or performance. 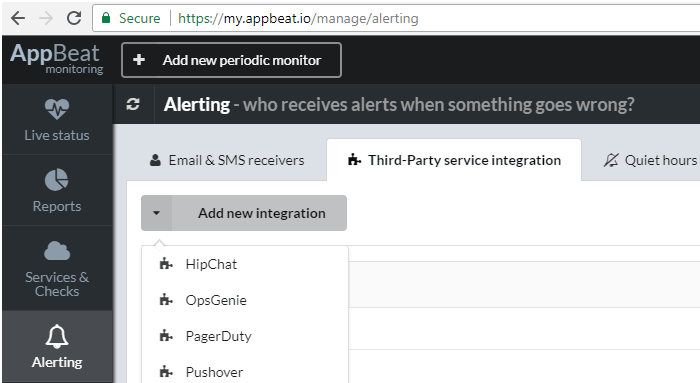 Get notified via email, SMS, HipChat, OpsGenie, PagerDuty, Pushover, Slack or dynamic webhooks. Reliable monitoring is our mission and number one priority! 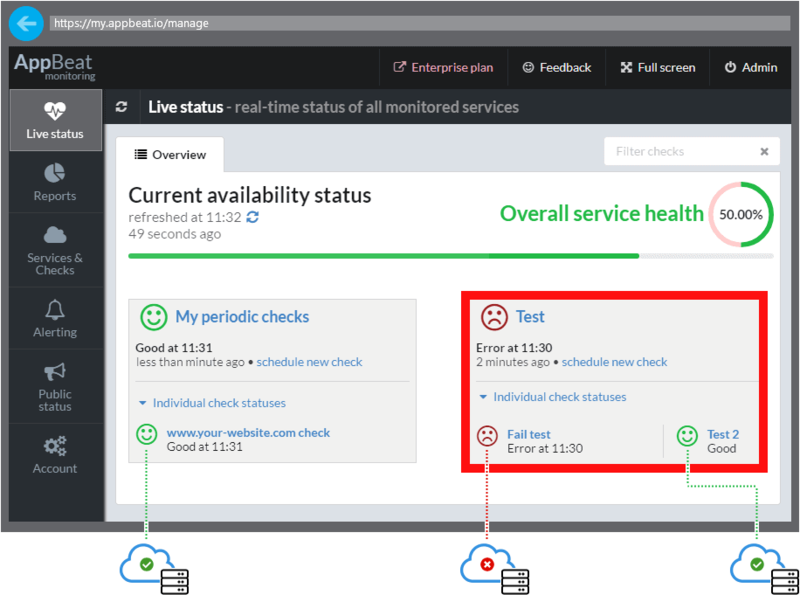 AppBeat Core monitoring system is running on distributed clusters in different regions with automatic failover capability. Each cluster can operate on its own. Azure SQL database is running in high availability mode. Our monitoring agents are globally distributed and elastic microservices (horizontally scaled with our userbase growth to ensure quality of service). We also offer service level agreement option (SLA) for our Elite plans with 100% monitoring uptime guarantee. As far as we know, we are the only monitoring provider with such option. Let your users know when you are experiencing service issues or having scheduled maintenance. 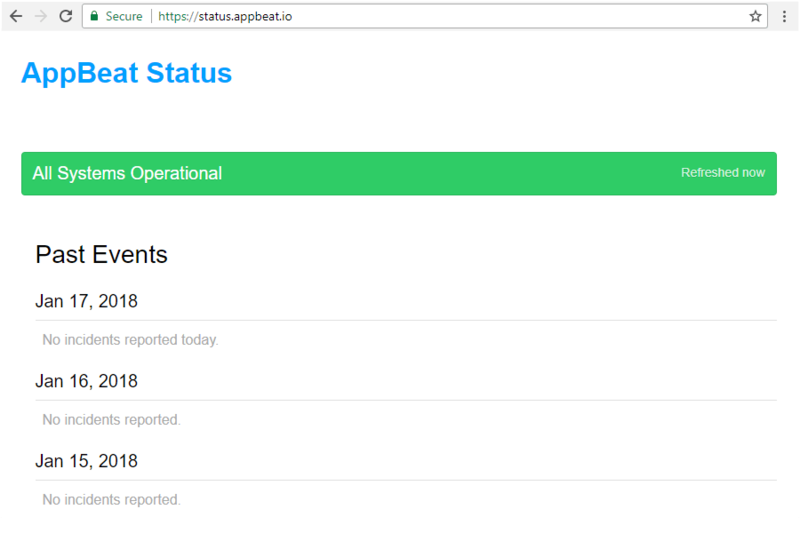 You can enable public status page with just one click (no third-party service required). AppBeat monitoring can minimize risk of losing your customers, time, money & brand reputation. Have questions? Please feel free to reach us, we are happy to help! © 2016 - 2019 AppBeat. All Rights Reserved.